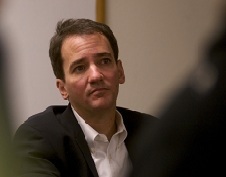 After 8 months of being in a silent lockdown mode on the subject of whether the White House offered the Democrat Senate candidate from Colorado, Andrew Romanoff (photo), a job if he would remove himself from the primary race, the Denver Post has finally gotten around to reporting on it again following their initial September story. By strange "coincidence" the Post's sudden willingness to once again broach this subject happened just hours after their bizarre silence on this topic was pointed out by various blogs on the web including the NewsBusters blog of your humble correspondent yesterday. Republicans trying hard to make Joe Sestak’s job-trading allegations stick are dragging Colorado Senate challenger Andrew Romanoff into the argument. Much of their ammunition comes straight from a Denver Post article last September by Washington correspondent Michael Riley. The Post article cited top Democratic sources saying the Obama administration “suggested a place for Romanoff might be found” in the executive branch. The implication was that the job would be available if Romanoff dropped any challenge to appointed Sen. Michael Bennet for the Colorado Democratic primary. Yes Michael. The Denver Post did break the story...and then went into lockdown mode on this subject for months until yesterday, hours AFTER their reticence to report about it was pointed out in the blogosphere. Romanoff today declined to comment on the issue. You might be able to ignore Sestak, but another similar story makes the plot far more plausible. None of this is exactly shocking stuff — but I was actually slightly surprised to find out that job offers of this variety were illegal. Yet, it is one thing for an administration to "urge" someone to make room for a preferred candidate and quite another for it to use its power to offer (or even discuss) a taxpayer-funded position as a payoff. Don't take my word for it. Axelrod says it's a breach of law. So welcome back, Denver Post, to reporting on the Romanoff job offer story...even if you had to be reluctantly dragged into doing so by the folks in the blogosphere.